I am now part way through my two weeks holiday, and so far so good, I have ridden the ponies every day, painted every day, and managed to get out in the garden ( although not today, as a little dull, with the odd rain, and even a thunder storm in the early evening). I bought some arches 300 lb watercolour paper yesterday, and am planning what to try out on it ( probably I will stay safe, hare, horse or donkey) I usually use 140 lb cold pressed, and in block form, as I use lots of water I think it will be interesting to see the difference, benefits, although I really can’t afford to buy archers too often. The price of their block was £40, so I feel pleased to have just one sheet to play with. I have already taken valued advice in purchasing a sable brush, and wow, it really made a difference, at least the brush I will have for life, if looked after well, but the paper is scary, especially if my painting goes wrong- at least with a canvas, if you go wrong you can paint over it. I suppose I can turn the paper over! Very exciting as yesterday I received my elegant writer calligraphy pens from America, I wanted to play/ experiment using them, staying safe I stuck with a hare, wow I love them. 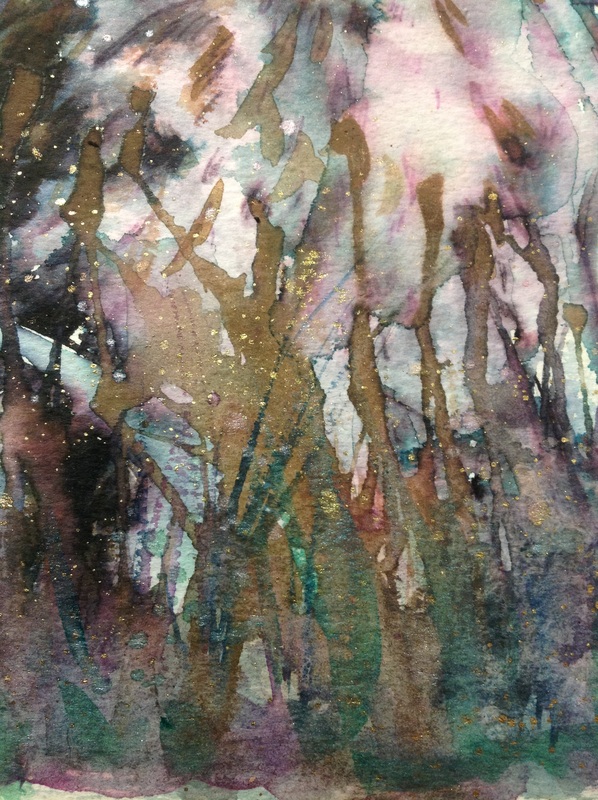 I created the grass using a straw to blow the paint, and then added splashes of mica, and gold paint. I had lots of fun creating this blue hare, and really am so in love with the colours achieved. Tonight I have started a donkey foal, which I photographed on the weekend, please see the photo in my last post, he is so cute, I think the colours will compliment his grey tones. Hopefully I will finish him tomorrow and post him here. 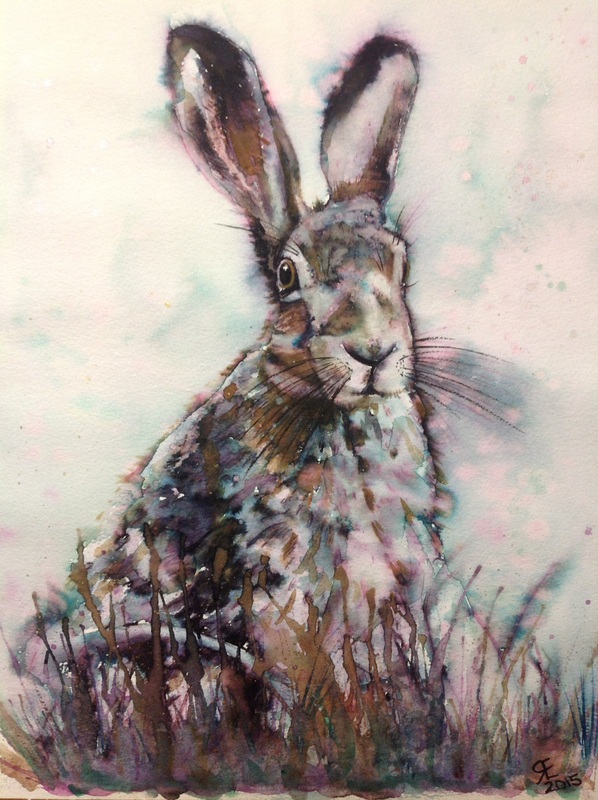 This entry was posted in art, Elegant writer, Hare, mica, watercolour and tagged art, Elegant writer, Hare, mica, painting, Painting, watercolour. Bookmark the permalink. Thank you Laura, he was lots of fun and relaxing to paint, especially loved adding the gold paint, it made me smile as it glistened back, especially when it was dull outside. Hi Laura, I completely understand I always used coloured pencils to create animal portraits, it was easy to create hair, although time consuming, the end result was very much a replication of the photograph. Watercolour is much more free, something I can struggle with in my head, as I always want to put in more detail, which can end up muddy, and I often loose my whites ( which happens in any medium for me as I am heavy with paint, I am learning and trying to change that, and watercolour has helped me) for this technique I used the elegant writer to sketch out the hare, and I put more detail in than I would with a pencil sketch, ( check out you tube, there are a few techniques, showing the elegant writer, I did it a little differently to those I have seen) I then blended with water the ink in the Areas that would be the darkest tones, let it dry, then I blended the lighter areas, but this time I blotted with kitchen roll, and you will get the pink tone immediately, finally I added Browns to the hare in watercolour, plus the grass, where I used a straw and blew the paint…..on and splashed gold paint, and then mica which was in a mister spray bottle. If you can buy an elegant writer it is well worth a try. I recommend hairy animals to start with, less bone structure to worry about, and you can cover mistakes with hair. I have been painting animals for years, but I really can’t do landscape, I am challenging myself to create some people paintings, if they turn up on here you know it went ok, if you never see them, it was a disaster! Yes it is water soluble, with a calligraphy nib, so square rather than fine liner, so you get the flexability of fine when used on its side, and wide when used flat. Thank you for your kind words, and thank you for following me.